Definitive's elegant and ultra-compact SuperCube subwoofers deliver ultimate bass performance from beautiful enclosures that fit anywhere. They combine Definitive - designed, digitally coupled (patent pending) Class D digital switching amplifiers (1500-watts SuperCube 6000, 1200-watts SuperCube 4000) with extremely long-throw, huge magnet, front mounted subwoofer drivers which are tightly coupled to dual side-mounted, pressure driven infrasonic bass radiators. The SuperCubes deliver incredibly deep, high-impact low-frequency performance with superbly tuneful high-definition transient response for bass that sounds as good with delicate music as with earth-shaking action movies. These remarkably compact superwoofers feature Definitive's signature piano-gloss black end caps and wrap around grille cloth styling. If you are assembling a reference home theater system with a high definition video projector or monitor along with an audio system that exceeds the sound quality and sheer visceral impact of premiere movie theaters, then this is absolutely the subwoofer for you. The Reference incorporates a 14 inch SuperCube Technology driver pressure coupled to two 14" Ultra Low Bass Radiators. The total piston area of this complement is an astonishing 460 square inches; equivalent to a 24-inch diameter woofer but with far greater speed, musicality and control than a single large diameter woofer could ever deliver. With that much moving driver area, you can fill any domestic living space with loud, visceral, deep and musical bass. How do you improve upon from the widely acclaimed SuperCube I subwoofer? 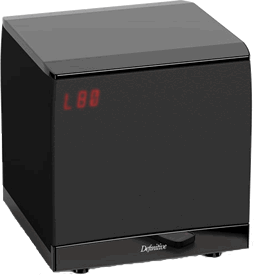 Definitive Technologies has done it again with the new redesigned SuperCube 6000 of course! Not wanting to rest on their laurels, Definitive's engineers have redefined what is possible in ultra-high quality, subwoofer. Starting with the drivers, Definitive has designed a new nine-inch subwoofer that utilizes a cast aluminum basket to hold its massive magnet structure and is pressure coupled to two ten-inch Ultra Low Bass radiators in an impossibly tiny enclosure about one cubic foot in size! This woofer and Low Bass Radiator combination gives a total piston area greater than a 14 inch single subwoofer driver, but with greater speed, attack, and musicality than a single driver could ever reproduce! To power this extraordinary woofer; Definitive has redesigned their 1500 Watt digital amplifier, is controlled by utilizing a powerful 56 bit Digital Signal Processor, DSP. This is basically a mini computer that monitors and tightly controls the subwoofer's excursion for powerful, accurate bass and help keeps the distortion extremely low. This means that you'll always get the most from your favorite movies and music recordings, with tight, articulate bass; not just boom and thuds that other subwoofer manufactures offer. Definitive SuperCube 6000, now includes a wireless remote to make all these adjustments from the comfort of your listening chair! Not only is this easier and less time consuming, but most importantly, the adjustments are now being made where you are actually enjoying your movie or music. Ever try to adjust your subwoofer while your favorite movie or music is playing? You know the drill; get up, get out the flashlight and reach behind the cabinet, adjust the subwoofer, and get back in your chair. Now more than likely, it wasn't the right adjustment, and you have to try it all over again! You can adjust the level, phase, crossover point, as well as, four different "listening modes". All this and more makes the new Definitive SuperCube 6000 subwoofer the complete package that will make all of your favorite movies come alive with great impact and deep bass extension, but also a sense of realism and musicality with your music that will keep you coming back for more! Subwoofer manufacturers are always talking about how "explosive" their subwoofers are, but there's more to Home Theater than rocket blasts and explosions; there is also music in the movies you watch, or the CDs you enjoy. And for music, the quality of a subwoofer’s performance is way more important than the quantity. The bass should be "tight," precise, and musical, the bass notes should have pitch, not just a dull thud or drone. Definitive Technology was started by, and is run today, by music fanatics and the very first thing they do to evaluate a subwoofer prototype design is to listen to music. If a subwoofer doesn't do an excellent job with music reproduction, it's not a Definitive! The new SuperCube 4000 includes a newly designed eight inch long-throw woofer that is pressure coupled to two eight inch low bass radiators in a tiny sealed enclosure. This gives the subwoofer is total "piston area" that is greater than a 12 inch woofer, but with greater control, speed, and most importantly, better musicality than a single woofer could ever deliver! The Definitive SuperCube 4000 is powered by an entirely new 1200 watt digital amplifier with special DSP processing that keeps the woofer reproducing deep, clean bass, note after note! And if that isn't enough, the SuperCube 4000 now includes a wireless remote to make all adjustments to easily "integrate" the subwoofer to the main speakers for the highest quality sound; all without having to reach behind the subwoofer every time! And with a new optional wireless module allows connecting the SuperCube 4000 to your receiver without having to run unsightly cables between the two. Great sounding, deep bass, with remote control, and wireless connection capability, makes the new SuperCube 4000 an unbeatable combination! The SuperCube 2000 is the upgraded successor to the SuperCube III - the most successful subwoofer in Definitive's history. 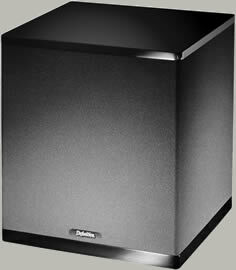 It incorporates a new 7-1/2-inch SuperCube woofer, pressure-coupled to two 7-1/2-inch ultra low bass radiators. The total piston area is greater than a 12-inch diameter woofer but with far greater speed, musicality and control than a single large-diameter woofer could ever deliver - and it all fits in an impossibly tiny enclosure that is easy to tuck away out of sight! The SuperCube 2000 can easily fill all but the largest domestic spaces with loud, extended, and musical bass yet it occupies less than three-quarters of a square foot of floor space! 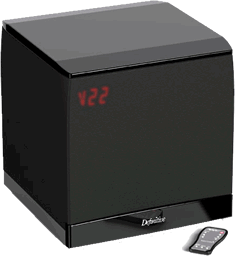 So if you looking for a great sounding subwoofer, but small size is desired, the new Definitive SuperCube 2000 is the one to get!